Anyone who has clicked on the Google logo today and gone exploring knows that today is significant for the author of The Grapes of Wrath, Cannery Row, Of Mice and Men, The Pearl, and Travels With Charley. 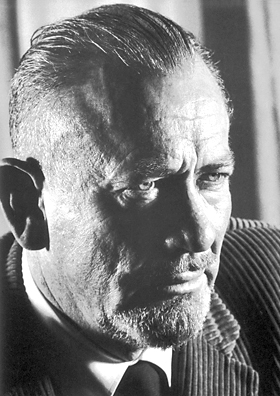 Celebrated author John Steinbeck was born on this day in 1902 in Salinas, California. He wandered the forests and fields of Monterey County, California as a youth, attended college at Stanford University without graduating, and earned money doing manual labor before heading to New York to try to make it as a writer. During the Great Depression, he lived in a cottage owned by his father in Pacific Grove, California, where he began to make a name for himself. His most celebrated and successful work was The Grapes of Wrath, which earned him a Pulitzer Prize for Fiction in 1940. Steinbeck received a Nobel Prize in Literature in 1962 which recognized the body of his written work. Nature and the common man were consistent themes throughout his writing. This entry was posted in birthday, literary and tagged authors, books, California, John Steinbeck, literature, Monterey County, Nobel Prize, Pulitzer Prize, Salinas Valley. Bookmark the permalink.